Went under the sun far too many times to be guilty of? We probably have all been there at some point in our life. Now, we stick to sheltered walkways and hide under our hats or umbrellas. You may not be able to visualize how much damage the sun has done to your skin because this damage is often not visible immediately. With all that damage done, how can we ever make up for it? There is still a way. Visible signs of photodamage can be improved by the active ingredients in cosmeceuticals. Or to put simply, a skincare regiment with IPL treatments can help to repair past damage the sun has caused on your skin. Signs of photoaging include persistent hyperpigmentation (read: dark spots), wrinkling, loss of elasticity and roughness. A good skincare routine is beneficial after your light-based therapies. They can help protect the skin from further damage by blocking UV radiation and slow down signs of ageing. Understandably, the most crucial product in a typical skincare regime is the sunscreen. It provides coverage against UVA, UVB and also infrared radiation. There are two types of harmful rays – UVA and UVB. The long wave ultraviolet A (UVA) rays can penetrate deep into our skin’s thickest layer, the dermis. The shortwave ultraviolet B (UVB) ray only burns the superficial layers of our skin and can cause skin cancer. The effects of UVA radiation are not felt even though damage can be greater as compared to UVB rays. Currently, there is no approved SPF rating system to measure UVA rays. SPF stands for sun protection factor. We usually see this rating on our sunscreens and it indicates the product’s ability to deflect UVB rays only as those are the rays that cause sunburn. The SPF rating is a measure of the time taken for you to sunburn when without sunscreen as compared to the time it would take with sunscreen on. We may tend to go for higher SPF ratings; thinking that an SPF of 30 would be twice as good as an SPF of 15. That is not how SPF ratings working. Instead, an SPF 15 sunscreen blocks about 94 per cent of UVB rays; and SPF 30 sunscreen blocks 97 per cent of UVB rays; and SPF 45 sunscreen blocks 98 per cent. There are no sunscreens that offer total coverage, with 100 per cent protection. So what is the ideal SPF rating we should go for? A safe number would be to choose at least SPF 30 sunscreens. Even sunscreens with high SPF numbers can become less effective when washed off when you sweat. Reapply every two hours for optimal protection. What does a broad-spectrum sunscreen do? Remember when we talked about UVA rays earlier? Even though there are no SPF ratings to measure the damage UVA rays can bring, we can classify products that protect you from both UVA and UVB rays as a broad-spectrum sunscreen. There are two types of chemicals in your sunscreen – organic and inorganic. Both types of chemicals work hard to minimize sun damage. Inorganic chemicals such as zinc oxide or titanium dioxide work by reflecting away the light. This is akin to having white paint to reflect light. Organic ingredients would absorb UV radiation and remove it as heat, to ensure radiation that reaches the deepest layers of our skin are as little as possible. We get sunburn as a reaction caused by exposure to the sun’s invisible UV radiations. Molecules in our skin, especially our DNA, can get damaged by the energy of the radiation. A sunburn is our body’s way of telling us that too much UV rays have been absorbed. When we are sunburnt, our body releases a type of pigment called melanin. This pigment works to protect cells from more damage. Melanin, as a natural sunscreen, will then absorb the UV rays and release it as heat. To avoid excessive sun damage, do remember to cover up and apply sunscreen liberally. Keep our SunProtector™ with you at all times to reapply every two hours. 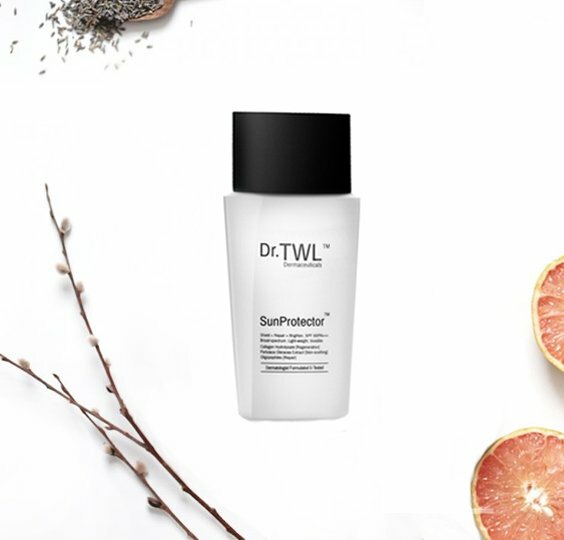 This dermatologist-approved sunscreen has an SPF rating of 50 and is broad spectrum. The effects of photoaging can be lasting and hard to rectify, but it is always easier to start earlier. Hyperpigmentation can be improved with regular sunscreen use. The SunProtector also contains collagen hydrolysate, known for cell regeneration. This collagen acts as a ‘glue’ among skin cells in photodamaged areas, allowing the skin to recover from injury.